Processors’ cooling and refrigeration methods may vary and extend the shelf life of some turkeys, therefore, best-before dates on product packaging should be consulted to determine how long fresh turkey meat can be safely stored in the refrigerator. If no best-before date is present, Health Canada recommends using refrigerated turkey meat within 2-3 days of purchase or ask at the place of purchase. 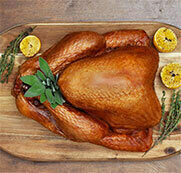 Turkey cuts can be kept frozen for up to 6 months. Ground turkey can be kept in the freezer for 2-3 months. Once thawed, treat previously frozen turkey meat as fresh and do not refreeze until cooked. Cooked turkey and cold cuts can be stored in a covered container, plastic bag or aluminum foil for up to 4 days in the refrigerator or up to 3 months in the freezer. NOTE: After cooking, keep turkey hot (above 140°F (60°C)) or refrigerate (below 40°F (4°C)). DO NOT LEAVE TURKEY AT ROOM TEMPERATURE FOR MORE THAN 2 HOURS!! !